Millennial buyers are sure to appreciate Scion's new Pure Process Plus, an online system that enables buyers to build, locate, finance, and purchase an iM without ever visiting a dealership. The 2016 Scion iM looks the part of the youth-oriented sporty hatchback, but doesn't drive the part. Until recently, the only hatchback this size at Toyota and Scion dealerships was the now-discontinued Matrix, a model that perhaps clung too closely to its Corolla roots. Now, with the iM, Scion reaches overseas, to some of the pedigree of the European-market Toyota Auris for some more performance flavor throughout. With the 2016 iM, Toyota dealerships at last get a sporty compact hatchback to tangle—and tango—with the likes of the Ford Focus, Mazda 3, and Volkswagen Golf. If only it hit that European stride, the iM would fare better in our ratings. The Scion's drivetrain is still pretty close to what you'd find in a some variants of the Toyota Corolla. This includes a 1.8-liter inline-4 that makes 137 hp and 126 lb-ft of torque. It's paired to a 6-speed manual or a continuously variable automatic transmission (CVT) that features a sport mode and manual control over seven programmed ratios. Hill start assist will keep the iM from rolling for two seconds. The problem? The iM weighs around 3,000 pounds and has less power than many of its rivals, and can't be called quick with either transmission. It has a sporty flavor, though, with standard 17-inch wheels and relatively wide tires—at least, generous for a somewhat efficiency-minded small car. MacPherson struts up front and a double-wishbone layout at the rear work with stabilizer bars in front and in back to deliver better handling than for the Corolla, and the four-wheel disc brakes acquit themselves well. The iM's electric power steering, on the other hand, doesn't communicate much road feel, and the ride quality can feel jittery. 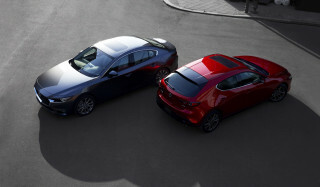 With a length of about 171 inches, the iM's size is similar to other compact hatchbacks like the Golf, Focus, or Mazda 3. The iM has generously bolstered front sport seats that are a step above the small-car norm, and the driver’s seat is height adjustable. The rear seats are split 60/40, and they fold flat for an expanded cargo floor. By the numbers for cargo and passenger space, the iM is right in the middle of its segment. The rear seat is strangely short on headroom, though, and there isn't much space in the cargo area when the seat backs are up. Interior material choice is a bit of a mixed bag. Materials used to upholstery seats and doors has a fairly cheap look and feel. The dashboard, on the other hand, is covered in a massive swath of piano black trim that probably appeals to the iM's target audience but cannot be touched with noticeable smudging. The iM includes an acoustic windshield and extra floor-silencing measures to cut wind noise and road roar, but noise is still a constant presence, if not always loud. Safety-wise, a rearview camera is standard on the iM, as is a driver-seat knee bag, in addition to the expected roster of airbags, stability control and anti-lock braking systems. A first-aid kit is included, and LATCH connectors for child seats are offered in outboard rear seats, with tether connections for all three seating positions. The iM isn’t close enough to the Corolla (or any other Toyota or Scion model) for us to extend safety results, but the latest Corolla has performed very well in crash tests and in Euro NCAP tests for Europe, the Auris on which the iM is based, has performed very well. The iM's mono-spec feature set might be more impressive than that of base model rivals. All versions include a 4.2-inch color multi-information display in the instrument panel—the first such appearance in a Scion. A navigation system is available with an upgrade kit. Other standard features in the iM's single well-equipped trim level include power-folding heated mirrors, dual-zone automatic climate control, cruise control, and keyless entry, and Bluetooth, and the infotainment system includes Pioneer audio with six speakers, a USB port, and auxiliary input. Scion doesn't offer any options from the factory, but buyers can customize their iM with dealer-installed accessories like a roof rack, cargo accessories, and a pet carrier, as well as performance upgrades like anti-roll bars, lowered springs, and an air intake system from TRD (Toyota Racing Development). 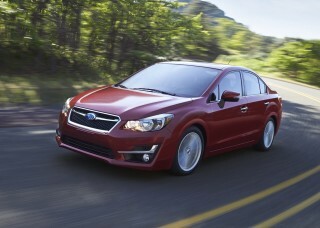 The EPA rates the iM at 27 mpg city, 36 highway, 31 combined with the manual shifter; 28/37/32 mpg with the CVT. Pardon me—is my Toyota Matrix showing? From the thrust of its nose to the slope of its tailgate, the iM's design creates a sense of forward motion. It's obviously a hatchback, yes, but it has a stylish sensibility that should negate negative associations in most minds. The piano black grille treatment is subtle but effective, and the imposing presence of 17-inch allow wheels enhances the iM's sporty look. It doesn't hurt that the iM bears a passing resemblance to the Toyota Matrix, a vehicle we enjoyed immensely when it was introduced in the 2001 model year. The second-generation Matrix? Not quite as much, but both hatchbacks cut a fine form that's been missed in the Toyota lineup since they were discontinued. While piano black trim inside the cabin makes a fashionable statement, the Scion iM's interior design is otherwise fairly straightforward despite some round vents and swooping lines surrounding a conventional instrument cluster and 7.0-inch monitor in the dashboard. The iM steers and accelerates without much enthusiasm, and the ride is rather jittery. A 1.8-liter inline-4 powers the iM with 137 horsepower and 126 pound-feet of torque. 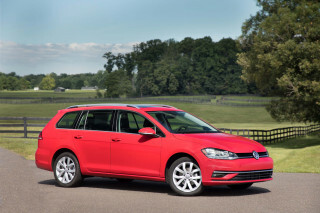 It's not quite enough to move the 3,000-pound hatchback with authority. The CVT with seven virtual speeds is, oddly, the transmission of choice for spirited driving. A sport mode keeps revs up, particular when it senses you're about to exit a turn. It helps wring the most out of the meager power on tap. Scion expects only 10 percent of buyers to choose the 6-speed manual, and that's probably for the best. Throws are long, action is imprecise, and clutch travel is long. That's a sharp difference with the also-new Scion iA. The gulf between manual transmissions is stark when driven back-to-back with the smaller iA, which arrived with the iM. 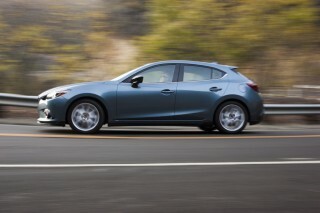 The iA was developed at Mazda, and it shows, with its precision and eagerness; the iM just doesn't meet that standard. Handling is sporty enough, thanks MacPherson struts in front, a double wishbone setup at the rear, and 17-inch wheels with unusually wide tires. But the electric power steering is oddly numb and uncommunicative. Most iM buyers won't push the hatchback to its limit, but if they do, it'll be hard to tell when they're approaching it. Still, it can be driven with more verve than the typical economy car, especially one at its price. Ride quality can feel unrefined, meanwhile, and is almost jittery over imperfections in the road. Rear-seat room is at a premium in the Scion iM, and most finishes aren't. The most distinctive design element in the iM's cabin is the wide swath of piano-black trim in its dash. It's a trendy material choice, and likely to appeal to the fashion-conscious buyers Scion hopes to attract. They might not mind that its sheer size seems like overkill, or that it's so easily smudged by fingerprints. 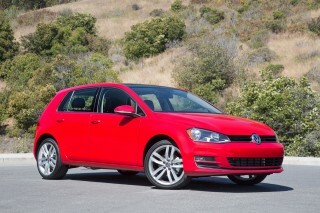 It's accented with plenty of upscale soft-touch trim. Less premium is the material used to upholster the seats and doors. It looks rather cheap and shiny, particularly in direct sunlight, and doesn't appear especially durable. The driver and front passenger have plenty of space, but that can't be said for passengers in the rear seat, where head room is in short supply and 6-footers will feel cramped. The cargo area is similarly compact when the 60/40-split seat backs aren't folded flat. Visitors to Scion showrooms may actually find that the iA's sedan body offers more useful space. Even with its sound-proofing, the iM allows a fair bit of road noise into the cabin. No crash-test scores have been reported yet, and most of the latest higher-tech safety features are absent. There isn't much data on the Scion iM from the two major U.S. safety organizations, but the scant information out there is mildly reassuring. 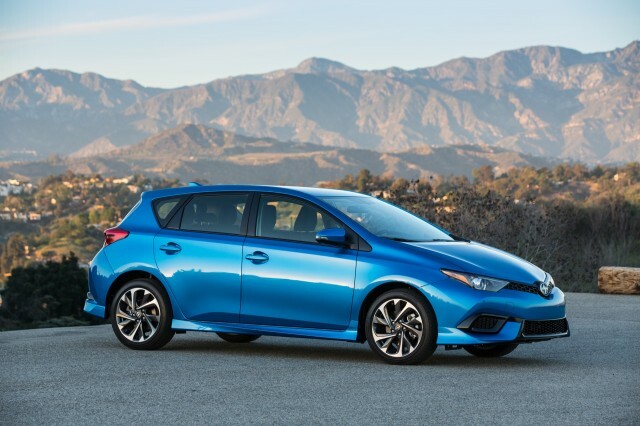 The NHTSA may not even have the Scion iM on their radar, but at least the IIHS has rated the hatchback "Good" on its moderate overlap crash and side impact protection. While the iM doesn't benefit from driver assists like lane-keeping alerts, it does have what Scion calls the Star Safety System, which includes stability and traction control, anti-lock brakes, a brake assist that adds full pressure during panic braking, and a "smart stop" feature that reduces engine power when the brake and gas pedals are used simultaneously in some situations. Outboard rear seats have lower anchors, and all three back seats have tether anchors for child safety seats. The iM comes with a first aid kit, a tire pressure monitor system, and a temporary spare tire. The iM's reasonably well-equipped out of the box, but Scion only offers a choice of color and transmission and some after-factory accessories. The iM comes in a single well-equipped trim level. Buyers choose only a transmission type and paint color. Standard features include automatic headlights, dual-zone automatic climate control, keyless entry, cruise control, power-folding mirrors, and a tilt-and-telescope steering wheel with audio controls. At the center of the instrument cluster is a color multi-information display—a first for a Scion. A 7.0-inch monitor, meanwhile, has AM/FM/HD radio, six speakers, an auxiliary jack and a USB port with iPod connectivity. Bluetooth enables hands-free phone and music streaming. Also included is Scion Service Boost, which provides two years or 24,000 miles of scheduled maintenance (whichever comes first) and two years of roadside assistance. Although options aren't offered from the factory, Scion dealers have an array of accessories that enable buyers to customize an iM. Fuel economy of up to 32 mpg combined is one strong reason to buy a Scion iM, though a Nissan Altima achieves the same figure for nearly the same price. Scion wants the iM to attract an active driver and pitches it as an athletic hatchback. Still, fuel economy is a better reason to shop for one versus its handling. 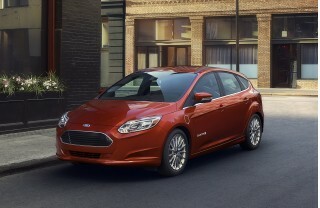 The iM is one of the more fuel-efficient new vehicles to be introduced for the 2016 model year. The EPA rates it at 27 mpg city, 36 highway, 31 combined with the manual shifter; 28/37/32 mpg with the continuously variable automatic. Along with versatility, one of the classic reasons to buy a compact hatchback is gas mileage. The Scion iM doesn't fail in that respect, though it's worth a reminder that some big family four-doors can equal these lofty fuel economy ratings—the Accord and Altima come to mind, even in non-hybrid form. Great Car at Amazing Price!! I bought this vehicle couple of weeks ago. I was a little skeptic based on all the online reviews, but one thing that these reviews fail to mention is value. Of course this vehicle is not going to do 0-60 as... I bought this vehicle couple of weeks ago. I was a little skeptic based on all the online reviews, but one thing that these reviews fail to mention is value. Of course this vehicle is not going to do 0-60 as fast as Lexus/BMW, but it is still one of the better ones in its segments. The smooth drive with CVT was extremely surprising, and everything about this car feels great. For the price you get tons of features that are extra buy in other brands. Also their grad rebate program is by far the best in the country, making the vehicle more accessible for younger buyers. Sporty, fun to drive, great mileage, love the iM! Looking for a different year of the Scion iM?